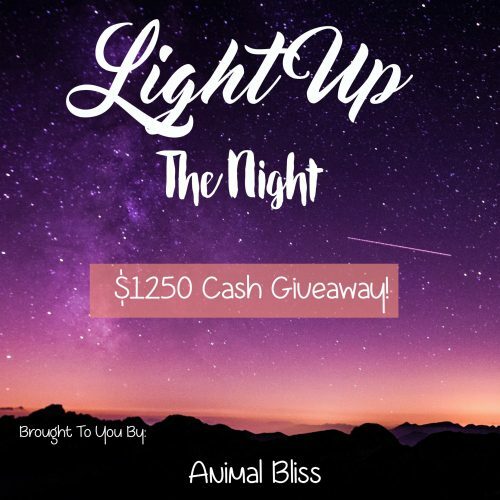 Light up the night … with your SMILE when you WIN our generous giveaway! A few of our fellow bloggers got together and pitched in some cash in order to give YOU a chance to WIN. TWO lucky people will WIN $500 each, and ONE other will WIN $250. What will you do if you WIN one of these cash prizes? I like spending quiet nights on the back deck with some cool drinks and a good book. I love to spend it at the beach. I;d like to spend them on the beach. I’d love to spend it travelling. I am fixing up my basement and need various tools and supplies. If I win, I might even be able to hire a professional to help. I like attending out door concerts and other performances. I like to spend it oudoors, watching concerts. My favorite way is to spend it on the beach with my family. Thanks for entering my giveaway, Soha. Good luck! I like to go hiking with family. I want to relax on the beach. My favorite thing is going to the pool. Oh, me too. Good luck with the giveaway, and thanks for entering. I like to veg out in front of the tv sometimes. My favorite way to spend the summer is at the beach, specifically Myrtle Beach. I haven’t been able to go in a long time because of financial issues due to health. Would love to go again soon! My sister goes to Myrtle Beach every winter for 3 or 4 months. She loves it too. I hope you’ll get a change to go again soon. Thanks for entering my giveaway. Good luck! Thanks for entering the giveaway, Lola. Good luck! I love to spend it abroad. I still have not made it to the beach but so far it has been a fun summer. More fun to come I hope. My favorite way is on a tropical island. I enjoy picnics in the summer with my family and drive in movies. My favorite way is to spend it near water. My favorite ws is to be on the beach. I like attending outdoor concerts and other productions in the evenings and nights. My favorite way is to lay on the beach. My favorite way is to travel all over. Love going for nice long drives with my family. Oh I forgot to say I am having a great summer with 2 of my granddaughters who are staying the summer with me. I love your blog, I read everything I see you post. I am a huge animal lover and you post a lot of great stuff. Would love to win your giveaway. Thanks for the chance. Thanks for your support, Angela. I see you on my Facebook page a lot, and I’m happy to have you as a fan. I can tell you’re a huge animal lover. Thanks for entering the giveaway. Good luck! I am entering on https://www.animalbliss.com/ and I love to travel. Good luck with the Giveaway, Soha. Thanks for entering! I just really love to spend time in the backyard with my furkids also going out to my daughter’s place in the hills and enjoying the outdoors. Thanks for entering the giveaway, Theresa. Good luck! I love having a quiet summer without a lot firm plans. Being able to pick up and go on small adventures is such fun! Good luck with the giveaway, Jeanna! Thanks for your visit. I am entering on https://www.animalbliss.com/ and I’d love to travel. Thanks for entering the giveaway, Ruth. Good luck. I like hanging out bbqing with family and friends. Thanks for entering the giveaway, Kamla. Good luck to you! The word of the day for 7/1/16 is Big Bird. I love spending the summer doing things with my family. I love cookouts and BBQ’s and bonfires especially. If I win I will go visit my cousin in the States.Take the train from Portland ,Maine and enjoy every minute of the journey.And to love her animals like I love mine. Love your emails about animals……Happy Canada Day! I like riding my bike on the lakefront in Chicago.